If you have a smartphone or anything else that supports wireless charging, today is your lucky day. 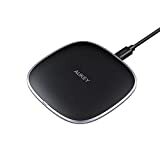 The AUKEY Qi Fast Wireless Charger is as good as any other fast wireless charging pad out there. It supports 5W standard charging, 7.5W fast wireless charging for iPhones, 10W fast wireless charging for Android phones, and it’s made by Aukey so you know the quality is top-notch. Use the coupon code 5YMQ2JL2 at checkout, and you can snag one for only $10! That’s the best price we’ve ever seen on any fast wireless charger from a reputable brand, and it’s a deal that will definitely sell out soon.